The Skrå 27 Rucksack may be the ultimate freeride pack, no matter if you prefer skis or snowboard. 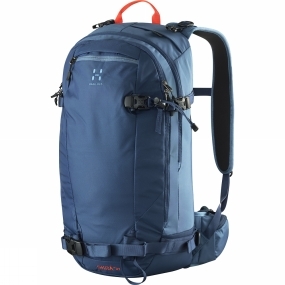 It holds no compromises, and is optimised for both freeride skiing and snowboarding.The front compartment for snow safety equipment and the spacious, easy accessible main compartment make it possible to bring all you need for a day in the backcountry.A lightweight frame gives stability to the pack and keeps it from collapsing when using the back panel opening. The pack can hold skis with a tail width of up to 150 millimetres.